FINE GAEL HAS held further talks with independent TDs today, but party leader Enda Kenny is being urged to make contact with Fianna Fáil as there is still no immediate prospect of a government being formed. The Taoiseach and a Fine Gael negotiating team met with a group of five rural TDs in Government Buildings this morning after the so-called ‘Rural 5′ said yesterday they wanted to progress talks with the largest party in the Dáil. The group consists of TDs Mattie McGrath (Tipperary), Denis Naughten (Roscommon-East Galway), Michael Collins (Cork South-West), Noel Grealish (Galway West) and Michael Harty (Clare). After this morning’s meeting, Naughten told TheJournal.ie that “nothing substantial was agreed”, with no discussions around cabinet posts, but that the group laid out its policy priorities. “The objective is to move this whole process on. We’ve had a month since the election, we’ve had face-to-face meetings going on for the last two weeks and we listened to what everyone had to say,” he said. We quizzed them on logistics of all of this. Then we decided that we’re going to intensify our discussions with Fine Gael and develop this partnership approach to a programme for government and see where it goes from there. But Naughten said that “the elephant in the room” is the need for Fine Gael to hold talks with Fianna Fáil, whose support will likely be needed in any minority government situation. The two big parties need to come together, they need to engage and we reiterated that again today, but there needed to be some new impetus to move this along. “We decided to grab the bull by the horns and we have now put the baton in the hands of Fine Gael. It is now up to them to carry that baton,” he said. Grealish told RTÉ that the group advised Kenny today that there had to be agreement with Fianna Fáil if any minority government is to be formed. “He [Kenny] acknowledged this, but he is hoping now that he can put a programme for government together,” Grealish said. For his part, Kenny did not take questions from the media about this morning’s meeting at an event to launch the 2016 Census. Further discussions are planned tomorrow morning, with Fine Gael hosting a meeting in Government Buildings with the Rural 5, the Independent Alliance, the Greens and other non-aligned independent TDs, including the Healy-Rae brothers, Maureen O’Sullivan and Katherine Zappone. Talks are expected to last all day with further discussions on Friday if needed. Naughten said his group is not ruling out further talks with Fianna Fáil. However it’s understood that the group has not yet responded to a document Fianna Fáil submitted to it last week and no immediate talks with Micheál Martin’s party are planned. Meanwhile, Sinn Féin president Gerry Adams joined the growing calls for Fine Gael and Fianna Fáil to engage in talks, saying it is “unacceptable” the Dáil will not sit again until 6 April. “The reality is that the Dáil could be meeting today, but Fine Gael and Fianna Fáil don’t want that. They want to jockey for position instead and are working together to ensure that issues facing ordinary people are not being be dealt with in any meaningful way. It’s time for Enda Kenny and Micheál Martin to sit down and talk. We’ve had gene-pool independents in recent days making overtures to Fine Gael in particular, but it’s all bluster. The reality is that no other combination of parties or TDs has the numbers to form a government, other than Fine Gael and Fianna Fáil. Speaking on Newstalk earlier, veteran Fianna Fáil TD Willie O’Dea said there had been “no overtures and no contact” from Fine Gael, but said his party remained open to discussions. “I think the Taoiseach said yesterday that he wouldn’t be prepared to talk to Fianna Fáil until after 6 April. Well, if that be the case then so be it,” he said. But if Fine Gael want to come and talk to us, then obviously we’ll talk to them. A senior Fianna Fáil source echoed this today, but said Fine Gael had made clear it would not be approaching the party until after the Dáil sits again on 6 April. Last night’s meeting of the Fine Gael parliamentary party was told that the negotiators want to pursue all possible options with independents and smaller parties before making any approach to Fianna Fáil. “We want to be in a position where you can’t say we didn’t try to form a government without Fianna Fáil,” a senior party source said. 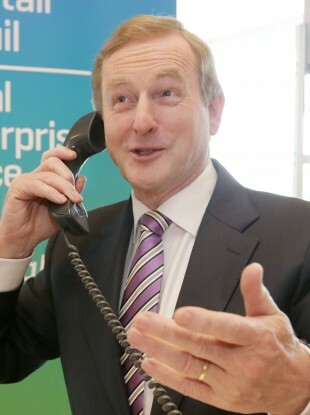 Email “As the wait goes on, Enda is told to pick up the phone to Fianna Fáil ”. Feedback on “As the wait goes on, Enda is told to pick up the phone to Fianna Fáil ”.